I went to see my nurse practitioner at the “regular doctor” office this morning. Kudos to her for ordering the spine xrays last week, otherwise, I’d still be at square one. I told her I was concerned last week that I was overlapping by seeing her before we had results from the urologist… she said it was wise to do that and it helped us get closer to a resolution. A lot of what she said was just a confirmation of what the urologist had said. There is osteoarthritis … which… could be from a lot of things… isn’t particularly uncommon and is not necessarily a big deal. 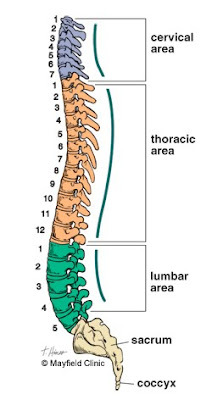 There is the “spondylolisthesis” (which I have finally learned to say) which is an overlapping of the vertebrae. The overlap is small – 3mm – but definitely causing problems. Oddly… I have an extra lumbar vertebrae. There are usually five – I have six. This is a congenital defect (in other words, I was born that way). This is causing a few problems… the nerves are being compromised, the muscles are being stretched …. Because the problem area is in my low back, sitting is painful. Because it’s compressing nerves, I get odd pains and sensations in other places than right at the spine which is why it initially looked like a kidney stone. The plan is to have me do physical therapy to stretch the muscles and solve that part of the problem. Because some nerves are compressed, it’s likely that the PT won’t solve all the problems… but we have to start with physical therapy to satisfy my health insurance company. After attempting physical therapy, the next step is a referral to a neurosurgeon… not because it’s necessarily a surgical issue, but because it’s a nerve issue. She prescribed lyrica – supposed to help with nerve pain. This is something that won’t ever really go away… losing weight will help as it will lessen the load on my spine. Physical Therapy will help with the muscle spasms. But mostly… it will be something I live with. So sorry to hear - I believe back pain is one of the worst and most annoying issues to have. I have some back pain that I have been dealing with on and off for about 20 years- mine is due to the weight as well as the fact that my lumbar area curves more out rather than in. When I was doing physical therapy after my knee surgery I realized after a few weeks that my back didn't hurt. Sadly when insurance stopped paying for my PT a few weeks later I started having back pain again. Not sure if that will work with you but I hope it gives you some hope about the PT. I wish I could go back but $$$ is not there at this point. You're in my prayers!